Once the laws of football had been formalised, it did not take long for them to spread across International borders, and almost inevitably, the first International game was played as far back as 1872. By 1906, football had become so professionalised that there was little room for the amateur in international football, and England started fielding an all Amateur International XI as well. Their first game was played in November 1906 and resulted in a 15 (fifteen) -0 win against France. The side for that match included players from South Bank, Newcastle United, Tottenham Hotspur, Old Malvernians, Old Foresters and Luton Town. I am not certain if that game was entered as an official first team international for France, but most of the Amateur teams early games were against the full international XI of their opponents, (which meant they awarded full caps, while England did not). The England Amateur XI won their first 17 games and went unbeaten through the first 20. (To be accurate, three of these games were played by the team as a GB XI, as they were part of the 1908 London Olympics). In March 1909, the England Amateur team beat the full International team of Germany by 9-0, and a month later they beat Belgium 11-2. Both these results are still recorded as the record defeat for the National teams concerned. Credit to Belgium though, as a year later, they gained a 2-2 draw with England (Amateurs) in Brussels, the Amateurs first failure to win. 1906-10 was a golden age for English International football with the Senior team also managing 18 unbeaten games between defeats in Glasgow in 1906 and 1910. The Amateurs finally lost in Copenhagen in May 2010. Denmark were the team beaten in the Olympic final, in 1908 and again lost to “England” in the 1912 final. The FA claim that England Amateur teams played at the 1908, 1912, 1920 and 1936 Olympics, but non English players may have been included in the latter pair. I do not have a full record of England Amateur games, but one notable fixture, 28 January 1939 saw England beat Wales 5-2 at Whaddon Road, Cheltenham. Although by that time Cheltenham were a member of the professional Southern League, GE Perkins was in the England XI. By that time, the England Amateur XIs had become quite London based. Apart from Perkins, only two players were not Londoners, the goalkeeper G. Whitehead (Bury Amateurs) and T.H. Leek of Moor Green. I am saddened to note that Bury Amateurs changed their name to AFC Bury at the start of this season. The England Amateur team was disbanded in 1974, basically because the distinctive name “Amateur Football” was being scrapped. The move was slow coming, and by 1974, many Amateur players were receiving so much boot money, that semi-professional clubs could not compete. Still, with a strong distinction between the professional game (as in Football League) and semi-professional (or amateur), as in everything non-League, there was a case for a representative XI at this level and so in 1979, an England Semi-Professional XI was started. The first game was a 2-1 victory over Scotland, at Stafford Rangers in May 1979, with the Netherlands beaten at the same venue a week later. Since then, the name of the team has morphed to the England National Game XI, and now England C, but the team has always been effectively the same, a representative side of the Football Conference, with the odd player entered from the lower leagues. Players have always come from the English non-League system (but including some playing for Welsh clubs), with I think just one exception. Kevin Todd, who I remember as a part of the Newcastle Blue Star team of the late 80s, made his one appearance in 1991, after signing for Berwick Rangers. The England C team (using its current name) was not even limited to Englishmen. While only three players have been capped for both the C team and at Full cap level, I can easily name an equal number of players later capped for other nations. For the record  the players who moved up to the England squad were Alan Smith (Alvechurch) and Steve Guppy (Wycombe),with Peter Taylor (Maidstone)dropping to the semi-professional team in 1984, eight years after he won a full cap. Meanwhile, in the early days, I clearly remember Eammon O’Keefe moving up from playing in those first two England games, to play for Eire after switching from Mossley to Everton, Barry Hayles has gone on to play for Jamaica, while Junior Agogo has played for Ghana. The first two of these at least were English born. Agogo was born in Ghana. In recent years, the shape of the Conference has changed. The effects of two promotion and relegation places has been to open up the Football League to those worthy non-League clubs which previously did not have the chance to improve themselves, but in reverse, the Conference itself has become the resting place for some many clubs with a lengthy Football League history behind them. Some of these clubs are getting far bigger crowds then their replacements; compare Grimsby, Luton and Stockport with Cheltenham, Morecambe and Macclesfield. Not surprisingly, these clubs have stayed full time professional, and the more ambitious clubs among the rest have also gone full time, boosted by increasing attendances and owners who put money in, (surely not still under the illusion that there is a pot of gold beyond any promotion rainbow?). So, as the distinction between the Conference and the Football League has been eroded, in terms of professional clubs and even in wages offered, the choice of running a England representative side for players from Conference level down is looking more and more arbitrary. Players do not take the drop in level simply to get into the England team, but they can get into the team by taking such a drop, while many of last season’s team cannot play this season, as they are with either Crawley or AFC Wimbledon and hence moved into the league. To my mind, the whole business of the England ‘C’ team is very arbitrary. Why do we award caps for one group of professional football players, while we have other groups of better players who are deemed too good to earn England ‘C’ honours, but fall far short of the standard required for England ‘A’. (The rarely used England ‘B’ designation is normally used for a reserve team of players picked from the same pool as the ‘A’ squad). The only criterion I see the current XI being based on is to make it competitive in those tournaments it enters, and to neither overwhelm, nor be overwhelmed by its opponents. This at least is achieved, with the eight games 2009-11 resulting in two draws, five English wins, all by a single goal and a 1-0 defeat to a Portugal XI in the final game of the last International Challenge Tournament. For England’s first International of the 2011-12 season, one could easily believe the squad had the ability to overpower their opponents. All but two members of the squad coming from the Football Conference, the odd couple being from Conference North. This predominantly professional squad was to play Gibraltar. 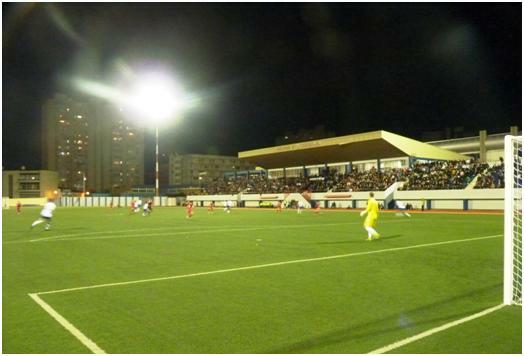 The Gibraltarian League being an all amateur combination, played on the single stadium within the territory. Only a couple of players from Gibraltar have moved on to play semi-professionally in the lower levels of Spanish football, and there are no full professional players at all in the squad. The local newspaper’s sports reporter, loyal to his team tells me that one or two players have been offered chances in England or Spain, but have not taken them up; and as the game is played, one can see that there is some talent around and maybe some players could have made a higher grade with full time training and coaching. The England team is very different to the one that played in the previous season. The age band, everyone over 20 and under 24 is very narrow, and only four players have played for England ‘C’ before, totalling only six gaps. The left back, Sean Newton (himself a late call up to cover for the inevitable absences in a team playing abroad on a Tuesday, when everyone has played club football on a Saturday) has two caps and is the only England player to have scored for the team before. Lack of experience, difficult transport regimes, and little training together would all conspire against a team that one would expect on paper (or for that matter on a 3G artificial surface) to be far stronger than their opponents. 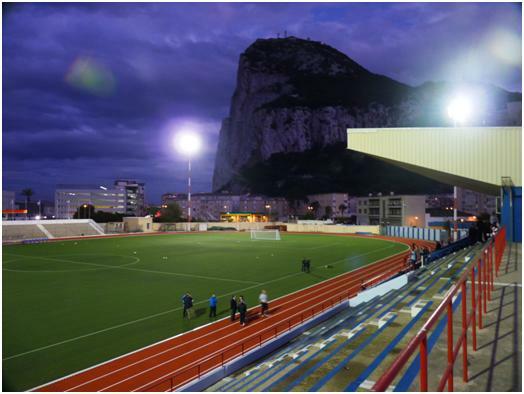 For the Gibraltarian team, there was no lack of preparation, the squad had been chosen weeks in advance and had been training together far more often than most club squads in the territory. Apart from the hope of a good game, and a close result in the match against England, the objectives of the Gibraltar FA are somewhat different to those of England. 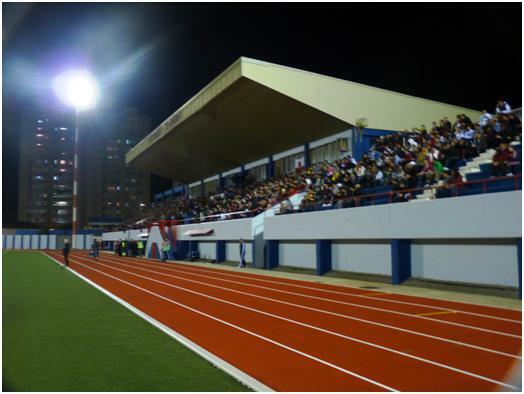 Soon after the Gibraltar FA was formed, it affiliated with the Football Association, and for many years had the same rights as any of the County associations, even though it did not enter clubs into FA Competitions, but seeing the explosion in the numbers of UEFA members, including the inclusion of other micro states (Andorra, San Marino) and dependent territories (Faroe Islands), there was a very good case for Gibraltar to join UEFA. The GFA’s original application for membership came in 1997, and FIFA pushed it out to UEFA for consideration. If Gibraltar were accepted as a member of UEFA, then FIFA membership would also follow. Back at the time, FIFA were proud of the fact that their membership numbers made it the biggest international organisation in the world, currently 208 members, compared to just 193 in the United Nations, and at the turn of the Millennium it seemed there were opportunities for more to be added into the mix. Gibraltar ceased to be a part of the English Football Association and with the territory enjoying a similar autonomous role, to say the Faroe Islands, the candidacy looked good. But there was one hurdle to overcome, and it was a big hurdle in the form of Spain. As soon as the Spanish Football Association (prompted by the government) objected to the inclusion of Gibraltar within UEFA, the plan was scuppered. I still believe the Spanish FA’s threat to leave UEFA if Gibraltar should be allowed to join is a bluff. With the National team for once on top of the World, and with Real Madrid and Barcelona carrying all before them on the club fronts, it seems they have a lot to lose by carrying out their threat. Gibraltar are pushing on with lobbying to bring the issue back to UEFA in the future, but despite confidence among some of the officials on the Rock, I feel it will be a long time before there is an change. The following match report was written for the non-League Daily web site, and appeared there the day after the match. The England C team were humbled by a well organised Gibraltar side at the Victoria Stadium, going down to a 3-1 defeat in their first game of the season. England C can call on any players outside the Football League, which at the top level means 24 teams of mainly full time professional players, but any number of semi-professionals in the lower divisions. Gibraltar has only two divisions of Senior football, comprising a total of 16 teams, and generally amateur status. Yes, it is true that Gibraltar can put out Manchester United players, but that is only because there is a team by that name in the local league. Two Gibraltarian players do play in the Spanish Leagues, but only at semi-professional levels. The game started in frenetic fashion, with more pace on display than purpose. England settled into a 4-4-2 formation, and appeared confident that they could play an attacking game. 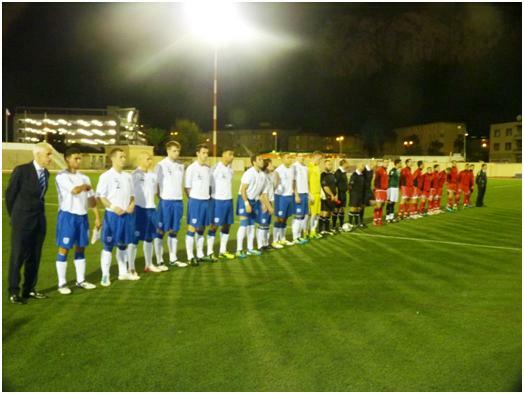 Gibraltar chose a more defensive minded 4-1-4-1 format, but from the word go they took the game to their opponents. The story for most of the first half was Gibraltar attacking with pace and flair, particular the pair who play in Spain, Joseph Chipolina, the left full back was a constant threat overlapping, while winger George Cabrera was the threat on the other flank. England managed to stand firm despite numerous attempts, and should have taken the lead on 38 minutes, Danny Rose crossed from the left and Adam Boyes shot against the bar. Lindon Meikle then attempted to get a grip on the loose ball, but shot high and wide. This cost England dearly, as we were suddenly treated to a display of pace from Lee Casciaro, swopping passes with George Cabrera and then firing Gibraltar into a deserved lead. After the break, England came out with six changes, but few differences. The goalkeeper, three midfielders and both strikers were swapped. Before the new grouping had even managed to greet each other and exchange names, the referee spots a stray hand where it should not be. Gibraltar’s Aaron Perez nets the resultant penalty. 2-0. For the next six minutes, England are just wondering what has hit them, and then thinking it may be worse, with Robert Guilling hitting the post after a good interchange between Cabrera and Perez  then it was worst. Guilling was allowed to stand alone on the half way line, where he was picked out with a perfect crossfield ball, running on alone before shooting past the advancing Preston Edwards. If Gibraltar ran out of steam after the hour mark, it was a sign of how much they had put into the early part of the game. Anyway, England continued to be disorganised, and despite having more of the ball, they could rarely show either enough guile or strength to worry Jordan Perez in the home goal. Gibraltar stuck to the game plan, 4-1-4-1 throughout, although they were flexible enough to rotate some of the players positions within this system. Roy Chinpolina, who had an excellent game started off shielding the back four, and later joined it. Cabrera took up the lone forward position from Lee Casciaro allowing Casciaro to drop back, while Brian Perez and Aaron Payas had excellent games wherever they played. Penalty  Gibraltar’s all important second goal. England did get a goal back with less than ten minutes to play, it was knocked in by Connor Jennings at short range, following a rare defensive mix up for Gibraltar. England commanded possession after this, but there was never a suggestion that the goal was anything but a consolation. Marks must go to Fairclough for demanding that his players went forward to applaud the home crowd at the end of the game. The crowd had chanted throughout (one of the few chants surely that uses the name of the organisation G-F-A, rather than the country). At the end they were calling again for UEFA recognition as well. England. Jonathon Hedge (Tamworth) (Preston Edwards (Ebbsfleet)), Shaun Beeley (Fleetwood), Sean Newton (AFC Telford), Jamie Turley (Forest Green), Rory McAuley (Cambridge United) (Adam Watkins (Luton)); Lindon Meikle (Mansfield), Jai Reason (Braintree), Danny Rose (Newport County) (Kenny Davis (Braintree)), Robbie Willmott (Luton) (Ashley Chambers (York)); Adam Boyes (Barrow) (Connor Jennings (Stalybridge)), John Paul Kissock (Luton) (Michael West (Ebbsfleet). All substitutions at half time, with Reason dropping from midfield to defence. Gibraltar is a curious place to visit, very welcoming and an odd mixture between Spanish and British. Public transport and the border crossings are now straight forward, so visiting the territory by crossing the border from Spain is now quite easy, as is using Gibraltar airport as an entry point into Spain (you walk across the Spanish border, about 100 yards from the airport terminal). One curious point, soon to be changed is that the only road into Gibraltar runs straight across the airport runway, and so closes when a plane takes off or lands, (fortunately, there aren’t many flights). If driving, queues to cross the border can be several hours in length, entering Gibraltar early in the day, and leaving from mid afternoon onwards. Even during the game, I could see the line of cars across the runway until well into the second half, I was told this meant a one hour delay if I had left the territory at that time. A new airport terminal is being built, and then a tunnel under the runway which will alleviate some of the problems and allow more flights into Gibraltar. The Stadium is next to the airport, and consists of a single cantilever stand over around 1000 seats. On the far side, some concrete seating has been built up, but this was not used for the International. This entry was posted on Monday, December 26th, 2011 at 10:56 am and is filed under Political Footballs, The European Game, The Non League Game. You can follow any responses to this entry through the RSS 2.0 feed. Both comments and pings are currently closed.